Today, the students and I in my literature course will take a break from poetry to listen to excerpts from Malcolm X's "Message to the Grassroots" speech. For years now, I've shared Malcolm with my classes. He's a dynamic speaker--shifting registers, making jokes, and weaving stories within stories. We have a good time listening. In some respects, our experience listening to Malcolm filters some of our approaches to poems, rap lyrics, and other reading materials throughout the rest of the semester. 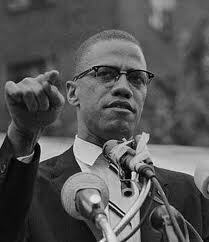 Relatively few of the students have been exposed to such an eloquent, intelligent, and militant black man. When I inform the class that large numbers of poets became influenced by Malcolm's content and styles of delivery, students wonder why they hadn't heard more of that rebellious brand of race consciousness in literature classes before ours. In 1966, editor Joe Goncalves noted that "If you want to grasp the importance of Malcolm X compare the late writings of Sonia Sanchez or Imamu [Amiri] Baraka with their early, pre-Malcolm works." According to Goncalves, Malcolm had clearly inspired those leading black arts poets and others to project a decisively militant type of verse. We might add that Malcolm also influenced the kinds of public personas adopted and adapted by poets; those personas were later taken on by many leading rappers such as Rakim, KRS-ONE, and Chuck D.
After Malcolm, students have a new or additional standard for what militancy in poetry might look and sound like, and they even read and hear older poems in new ways. Claude McKay's "If We Must Die" and Langston Hughes's "Still Here," for instance, sound even more defiant for readers who possess a sense of Malcolm's rhetoric circulating in their heads. Reading poetry after Malcolm expands opportunities for imagining diverse tonalities of speech, performance, and poetic delivery.